What a difference a year makes. Twelve months ago the Bitcoin market was absorbing the impact of the seemingly overnight collapse of Mt. Gox, its largest exchange. The cryptocurrency’s value was in freefall from a peak of around US$1,200 in November 2013. And news headlines questioned the digital currency’s viability as concerns over security grew. Into that vacuum ran Wall Street. Hardly a week goes by now without news of another household name investing in or taking a position with a Bitcoin market startup. Among the most notable figures to dive in are Arthur Levitt, Jr., the revered former chairman of the U.S. Securities and Exchange Commission; and Duncan Niederauer, former New York Stock Exchange CEO and Managing Director at Goldman Sachs. Nearly every large Wall Street bank has a senior executive defector who is now operating in the Bitcoin marketplace, and firms like Goldman Sachs and NYSE are taking direct stakes in it. There’s a listed Bitcoin Investment Trust that began trading today, a Bitcoin derivatives exchange, and both an ETF and swap instrument on the way. And last month, the “first” Bitcoin broker/dealer formally introduced itself. So all the pieces are in place. In the course of a year and change, we’ve seen an entire market system develop, efficiently and effectively and with minimal regulatory involvement to date. As an aside, it’s remarkable how much smoother the institutional market building process has gone for Bitcoin than it has for the Swap Execution Facility market, which effectively began in 2010. (That could make for a nice Keynesian vs. Friedmanite debate). So what will Bitcoin’s legacy be? Will it be something that makes Wall Street money or something that saves them money? It certainly seems that the short-term bet is on investors making (or losing) money based on fluctuations in its value, just like in the FX markets. The planned ETF and swap products will also no doubt provide different levels of exposure and hedging for investors with varying appetites for risk. But the more compelling, long-term narrative around digital currency is the ability of its blockchain technology to revolutionize institutional payments. Blockchain is a distributed, secure database technology that enables real-time transaction accounting of Bitcoin payments. To repeat, blockchain enables real-time, global transaction accounting. How might this eventually change Wall Street? Today, transactions in the U.S. equity markets occur in nanoseconds, or a few billionths of a second. And they take three days to settle. You could order and receive almost anything on Amazon faster than you could settle a purchase of IBM stock. There will no doubt be a number of hurdles to cross before Bitcoin enhances or replaces existing Wall Street post-trade processes. The technology certainly has the potential to improve post-trade transparency, reduce trade failure risk, and provide regulators with a much simpler audit trail than the one they had to unwind after the credit markets collapsed in 2008. And if blockchain technology becomes the de facto payments network of the future, that would ensure sustained demand for digital currency−good for both traders and investors. What are the biggest obstacles you see to Bitcoin moving into the Wall Street middle office? 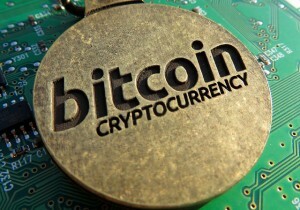 Photo credit: BTC Keychain, Flickr.